7.0 Earthquake hits the Flores Sea. There was no tsunami threat due to the depth of the earthquake (355.4 miles deep). 5.7 Earthquake hits the Anatahan region in the North Mariana Islands. 5.1 Earthquake hits the Alamagan region in the North Mariana Islands. 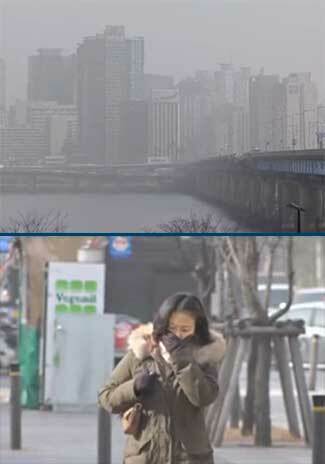 South Korea was hit by the highest concentration of toxic yellow dust in five years as winds from China’s industrial centres, located to the north and west, blew in the acute air pollution. The chemical-laden dust typically arrives each winter from southern Mongolia and northern China, where deserts have experienced meagre precipitation and swirling low-pressure areas. Residents across most of South Korea were advised to stay indoors or to wear protective masks and goggles when venturing outdoors. The pollution is known to cause cardiac and respiratory problems, especially among the very young and the aged. Seoul skyline dulled by thick pall of yellow dust as a pedestrian tries to protect herself from the pollution. U.N. aid agencies are increasing operations in flood-stricken Malawi in a desperate attempt to stave off a potentially large-scale cholera epidemic. The United Nations Children’s Fund says Malawi is on high alert following a cholera outbreak in southern border areas, near Mozambique. U.N. aid workers are alarmed at the prospect of a large, nationwide outbreak of cholera in Malawi. This is because the disease is located in the southern border areas where flood victims are living in overcrowded camps, an environment in which cholera flourishes. The last time the country experienced a large-scale outbreak was in 2009, when well over 1,000 people were infected. Stromboli (Eolian Islands, Italy): Strombolian activity from the summit vents continues slowly to increase but always below normal levels. In the morning of Feb the 15th a brief but energetic series of 7-8 strong explosions occurred less than 2 minutes:it was characterized by the most powerful explosion observed since the end of the effusive activity. …27 Feb: Strombolian activity from the summit vents continues slowly to increase but always below normal levels. Tropical cyclone (tc) 14s (Glenda), located approximately 573 nm east=southeast of Port Louis, Mauritius, and is tracking southward at 07 knots. Pakistan – Heavy rains and hailstorms have claimed lives of at least six people in Pakistan’s Khyber Pakhtunkhwa province and the adjoining Federally Administered Tribal Areas. Nepal – Heavy rainfall together with hailstorm have destroyed crops in various parts of Kailali and Doti districts. Heavy snowfalls have been reported in Mugu and Rasuwa districts. 2 people died after being struck by lightning. The Pacific Ocean has been a planetary air conditioner for the past two decades, but the relief may soon end, a new study finds. The Pacific and Atlantic oceans undergo decades-long natural oscillations that alter their sea surface temperatures. These natural cycles flip-flop between cooler and warmer phases. Over the past 130 years, the tempo of global warming has revved up or slowed down in tune with changing ocean temperatures, researchers reported today (Feb. 26) in the journal Science. “The Pacific Ocean appears to be driving the slowdown in warming over the past 15 years,” said lead study author Byron Steinman, a climate scientist at the University of Minnesota-Duluth. The period since 1998 is often called a global warming pause or global warming hiatus, because the planet’s thermometer slowed its steady climb. However, it’s more accurate to call the intervening years a global warming slowdown. Temperatures never stopped rising, and the 10 hottest years ever recorded have all happened since 1998. And though global surface temperatures have plateaued, the oceans are still warming — studies have found the “missing” heat is going into deeper layers of the sea. Fresh leaks of highly radioactive water have been detected at Japan’s crippled Fukushima Daiichi nuclear power plant four years after a massive tsunami disaster resulted in explosions and meltdowns at the facility. Sensors detected contamination levels up to 70 times greater than the already high levels of radioactive cesium and strontium-90. 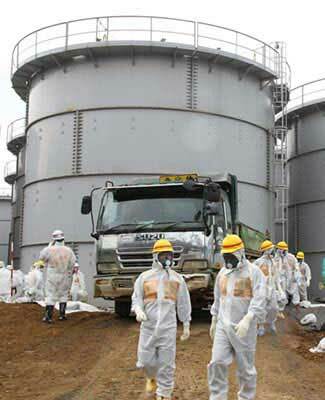 Tokyo Electric Power Company (TEPCO) says the leaks came from gutters that sent accumulated rainwater on top of the highly contaminated facility into a drainage ditch that carries runoff to the Pacific. The company concedes it has known about the leak since last April, but failed to disclose the finding. A spokesman said workers have blocked the gutters from sending any more roof runoff into the ocean. The company is also plagued by a flow of groundwater from mountains to the west, which becomes contaminated as it passes beneath the plant and into the Pacific. Efforts to freeze the ground with refrigeration equipment and halt that flow are underway, but are being met with great public skepticism. The week’s hottest temperature was 116.6 degrees Fahrenheit (47.0 degrees Celsius) at Wad Madani, Sudan. The week’s coldest temperature was minus 66.5 degrees Fahrenheit (minus 54.7 degrees Celsius) at Russia’s Vostok Antarctic research station. On 23 February 2015, the Department of Health, Hong Kong Special Administrative Region (SAR), China notified WHO of 1 additional laboratory-confirmed case of human infection with avian influenza A(H7N9) virus. A dairy cow has died of Anthrax on a farm in northern Victoria. The farm has been placed under quarantine. Famously crowded Japan is getting a bit more space as a newly-formed volcanic island just keeps on growing. New footage of the remote Nishinoshima, some 1 000km south of Tokyo, shows a volcano erupting up to six times a minute, spewing huge volumes of magma, and scientists say there is plenty more still to come. A tiny islet emerged in November 2013 right next to the original Nishinoshima, when molten rock cooled and began to poke its head just above the water. That speck of land grew as the volcano kept going, and soon engulfed its once larger neighbour. 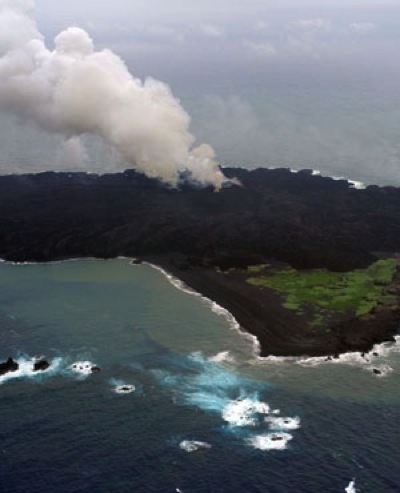 The new super-island is now a respectable 2.46 square kilometres, the Japan Coast Guard says — roughly the size of 345 football pitches, while the still-spewing volcano is now a healthy 100m tall. 5.3 Earthquake hits the Hindu Kush, Afghanistan. Tropical cyclone (tc) 14s (Glenda), located approximately 586 nm east of Port Louis, Mauritius, and is tracking south-southwestward at 07 knots. Afghanistan – A series of avalanches have struck north of the Afghan capital, Kabul, killing at least 124 people. The snowfall has been concentrated in Panjshir province, where two schools and a mosque and around 100 homes had been destroyed. 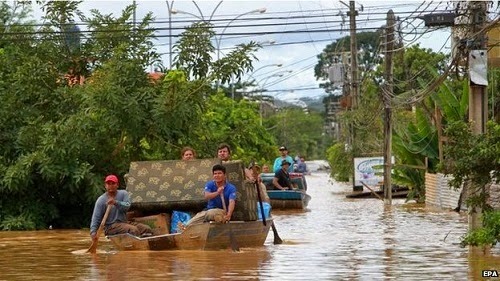 Lebanon – A deluge of rainwater flooded the streets of Zahrani Wednesday, forcing Syrian refugees to abandon their swamped tents in the southern village. 5.5 Earthquake hits the Sulu Sea. 5.1 Earthquake hits the Democratic Republic of the Congo.